Best World Cup TV and home cinema deals | What Hi-Fi? 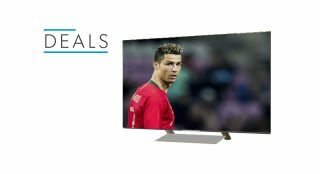 The biggest tournament in world football is underway - so whether you're planning to watch in SD, HD or 4K, now is the perfect time to check out the best World Cup TV and home cinema deals. What better way to welcome the World Cup into your living room than with a shiny new 4K TV? To help you land your dream screen, there are a number of retailers offering a wide range of deals, discounts, bundles and other incentives. Both the BBC's and ITV's coverage will be in standard- and high-definition as standard, and the BBC has confirmed that 4K HDR trials will also be available courtesy of the iPlayer. The tournament kicks off on Thursday 14th June with the opening ceremony followed by hosts Russia versus Saudi Arabia (4pm). So what exactly are these amazing TV deals and where can you get them? Read on for all the necessary info. AO.com is offering you the chance to claim up to £300 back on certain TVs, 55in and above. There is a catch, though. England need to qualify from the group stages of the World Cup for the offer to be valid. Also, the amount you can claim back varies between TVs. Some of the cheaper televisions will only result in £20 cashback, others £30, £50, £75, £100, £150 and £200 depending on the model. You can find the full list of TVs that are included in cashback promotion on the AO.com website. As part of its Big Red Event, Argos has shaved a few pounds of a wide range of TVs and is also including free delivery with certain models. John Lewis is offering up to £500 cashback if you buy an LG OLED TV or Super UHD LCD with its AI ThinQ technology built-in by 10th July. Models include the LG OLED55E8PLA and the LG OLED65C8PLA. Richer Sounds has a mix of TV deals for the 2018 World Cup. You can get 5% off certain sets with the voucher code 'WC5' and £20 off some sets with the code 'WC20'. Samsung's online store is running its own promotion during the World Cup. If you buy any qualifying QLED or 4K Ultra HD TV by the 3rd July, you can claim your national team's football shirt for free. You'll need to make your claim within 60 days of making your qualifying purchase and need to upload a digital copy of the serial number of your TV and your receipt. Once validated, you'll be able to claim a voucher to use against the purchase a football shirt. All the terms and conditions of this offer can be found on the Samsung website.